Building on last year’s success, each day of the week leading up to Homecoming will feature a unique, purpose-filled opportunity for service and fun, including Mission Monday, T-Shirt Tuesday, WOW Wednesday, Thank You Thursday and FANtastic Friday. Learn more about each day here. Additionally, throughout the month of February, Belmont will be participating in a canned food drive for donations to Second Harvest Bank. Everyone is invited to bring their donations such as peanut butter, canned meat, canned fruits and vegetables, soups, pasta and cereal, to the Foutch Alumni House (by the Bell Tower). Check out the Mission Monday theme box for all of the donation options (and prizes!). Highlights of the week can be found below, and for a complete list of all Belmont Homecoming 2018 events and an opportunity to register, click here. 5:30-7:30 p.m. – Curb College Presents From Here to Anywhere: an intimate conversation with CBS Evening News Associate Director & Graphics Producer Chris Mix-Foley (’08) and Maverick Digital Marketing Manager Sheila Hozhabri (’05). 5:30-7:30 p.m. – Massey College of Business Networking Event: Meet with Dean Pat Raines as well as undergraduate and graduate alumni from the Jack C. Massey College of Business. 6-7 p.m. – Career Conversations, Bruin to Bruin: an informative and informal networking event for alumni and students. 9:45 a.m. – 3:45 p.m. – College of Law Faculty Scholarship CLE: All College of l=Law alumni and Belmont undergrad alumni in the law profession are invited to attend this free CLE event. Registration is required and can be completed here. 7:30 p.m. – “These Shining Lives” by Melanie Marnich, Belmont University Theater Program: Tickets are $5 for Faculty/Staff/Alumni and free for students. Get your tickets here. 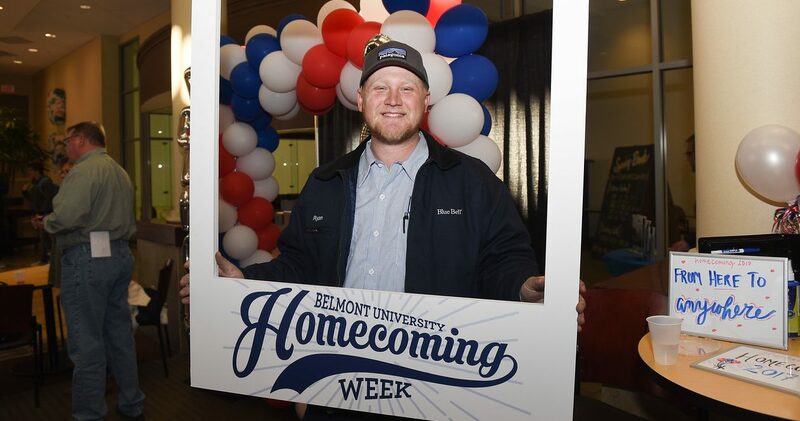 10-10:50 a.m. – Belmont’s First Sports Ministry Coordinator Jordan Holm (’16) will speak about his work with student athletes, the Fellowship of Christian Athletes and the Sports Evangelism Mission Program at Homecoming Chapel: Sports on Mission. 7 p.m. – The 6th Annual Homecoming in the Round concert, recognizing decades of talented Belmont songwriters in celebration of the 10th anniversary of Belmont’s Curb College Songwriting major. Tickets are free and can be found here. 10 a.m. – Tower Society reunion, Annual Brunch and Induction Ceremony: celebrating the elite group of alumni from Belmont’s 50-year or earlier classes. 11 a.m. – Parents are invited to stop into the Gabhart Student Center for coffee or hot chocolate and the latest news from Provost Thomas Burns. 11:45 a.m. – 12 p.m. – Join the Belmont family as we give thanks for our past, the present and pray God’s blessings on our future at Homecoming Prayer and Worship, hosted by University Ministries. 12 p.m. – Homecoming 2018 All Alumni Homecoming Celebration: All alumni are invited to stop by the Foutch Alumni house for this pre-tailgate celebration! 12:30-2:30 p.m. – Tailgate at the Tower: It’s Bruin Time! Everyone is invited to this campus-wide celebration during Homecoming 2018. 1-7 p.m. – Alumni Pep Band, 50th Anniversary: the Bruin Blast Pep Band invites alumni from 1967-2017 to join us and play for the doubleheader basketball games on Saturday. 8-10 p.m. – Young Alumni Homecoming Social: A Homecoming Tradition! Can’t make it to Homecoming 2018 events? Plan now to post your favorite Belmont photos during the week of Feb. 19-24 using the hashtag #BUHome18.